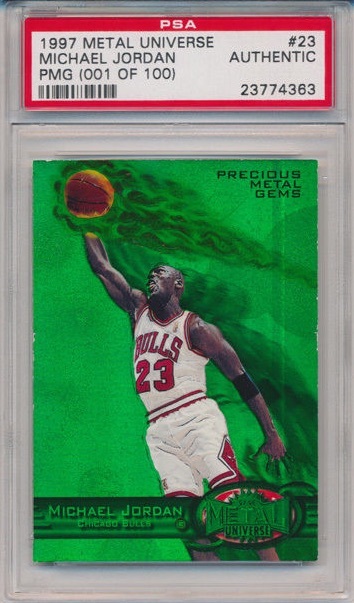 A key part of one of the most iconic parallel sets in the modern hobby, the Precious Metal Gems (PMG) cards have long been a source of high value and interest from the collecting world, and Michael Jordan is at the forefront. Although bidding for the Michael Jordan PMG Emerald ended at $91,300 on eBay, it appears that there were some issues for the auction on the final day. As many collectors know, Precious Metal Gems parallels were available as colorful foil editions in 1997-98 Metal Universe Basketball. Limited to 100 total copies per player, the first 10 cards in the print run are green and the final 90 are red. Given their rarity and age, the Red parallels for Michael Jordan don't surface often and the Emerald parallel is rarely seen. This auction is very appealing as a green version of the original Michael Jordan PMG. On top of that, the card in question is #001 of 100, giving it added significance for many collectors. Because of the parallel-within-a-parallel format, it is really #1 of 10. View Michael Jordan Precious Metal Gems cards on eBay. One major downside to the PMG parallels, outside of the price and extreme rarity, is that they are very fragile. Many exhibit considerable wear due to the foil fronts. The Michael Jordan PMG card at auction is slabbed by PSA, but the card is only listed as "Authentic," with no grading provided. As noted in the listing, "This card was encased to show that the card is the true pack-pulled card. The seller chose not to have a third party authenticator assign a grade to the card since it truly is the only one in existence from the original print run from Fleer. The card does have chipping on the edges and corners." 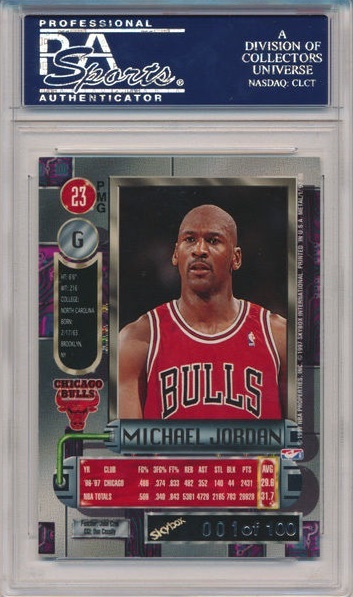 As shocking as it seems, the Michael Jordan PMG card was acquired by the original owner in a pair of 1997-98 Metal Universe boxes that were purchased on eBay. Although he planned to keep the two boxes as an investment, he succumbed to the collecting urge. While the first box yielded nothing notable, he was rewarded in the second box with one of the rarest parallels in the hobby. The nearly-mythical Michael Jordan basketball card was available through a ten-day auction on eBay with Baseball Card Exchange, an online retailer with a physical store in Schererville, Indiana. The card was available for viewing during the 2015 National at the BBCE booth. The auction closed on Sunday, August 2 at 10 PM EST and bidding reached $91,300 with 91 bids. View the result here.